← The inequity of America’s tax laws. Barefoot Accountant’s interview of Susan Bysiewicz, Connecticut Democratic primary candidate for U.S. Senate. Part III of interview. Cenk Uygur: President Obama is in Kansas yesterday, and something surprising happened: he gave a really progressive speech. Okay, that’s fantastic. But as you read or heard the speech, I thought, I wish he meant it. So what I am going to do is break down the speech and show you what he said and what he has actually done over the last three years. So let’s look at the first part. President Barack Obama: For most Americans, the basic bargain that made this country great has eroded. Long before the recession hit, hard work stopped paying off for too many people. Fewer and fewer people who contributed to the success of our economy actually benefitted from that success. Those at the very top grew wealthier from their incomes and investments, wealthier than ever before. Cenk Uygur: Yeah, that sounds great. The only question is, what did you do about it in the last three years. And let me tell you the real record. When it came to hedge fund managers, they get a 15% tax rate, which is lower than that of the average American. When it came to capital investment, dividend investment…capital investment is over 50% for just the top 1%…that tax rate is also at 15%, and also less than that of the average American. So why did they get to keep all those tax breaks under this so-called progressive administration? Meanwhile trillions in spending cuts, including heating assistance to poor families who are now getting totally cut off: in New Jersey there are a quarter of a million families who need heat in the middle of winter who won’t be getting it….So why did you maintain that system? I wish that you really believed what you were saying. Now let’s go to the next clip. President Barack Obama: Remember in those years, in 2001 and 2003, Congress passed two of the most expensive tax cuts for the wealthy in history, and what did it get us? The slowest job growth in half a century. 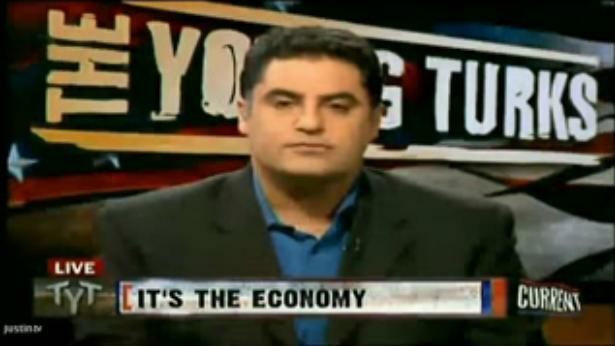 Cenk Uygur: Alright, that’s true. So why did you renew those Bush tax cuts?! I know what your answer is: Oh my God, the Republicans made me do it. But if the Republicans make you always do what they want, then why did we elect a progressive president? So I can’t believe that you are talking about the Bush tax cuts when you agreed to extend the Bush tax cuts. To me, all this talk is fine but you gotta walk the talk, and he didn’t do it. Now watch this next part. 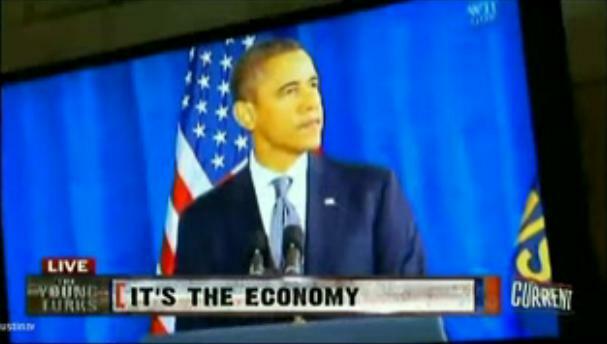 President Barack Obama: We all know the story by now. Mortgages sold to people who couldn’t afford them, or even sometimes understand them. Banks and investors allowed to keep packaging the risks and selling it off. Huge bets and huge bonuses made with other people’s money on the line. 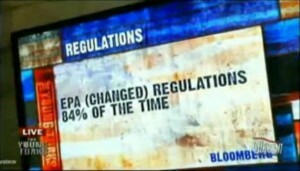 Regulators who were supposed to warn us about the dangers of all of this but looked the other way. Cenk Uygur: Right. So what did you do with the regulators? Under Bush, I agree with you that the regulators were totally relieved of duty, basically. 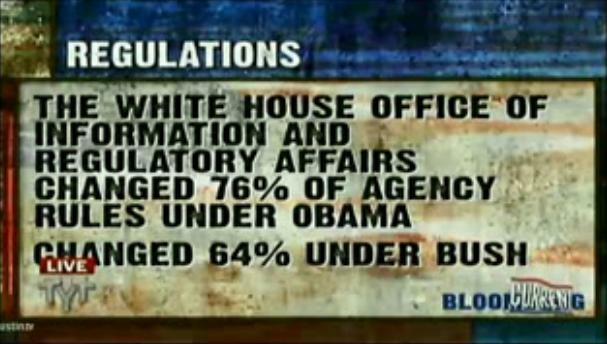 There’s a little office called the Office of Information and Regulatory Affairs. What it does is after the regulations are passed in the different departments, it waters them down. 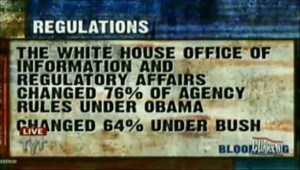 So under Bush, 64% of the regulations got watered down, which is terrible, right? Under Obama, it was 76%: it was more!!! Why did you water down regulations more than Bush did? That doesn’t make any sense? How about for the EPA, the Environmental Protection Agency. 84% of the regulations were watered down. So where are those regulators that you were talking about? I wish you meant it but you didn’t. Here’s another part. President Barack Obama: Now in the midst of this debate, there are some who seem to be suffering from some kind of collective amnesia. After all that’s happened, after the worst economic crisis, the worst financial crisis, since the Great Depression, they want to return to the same practices that got us into this mess. In fact, they want to go back to the same policies that stacked the deck against middle class Americans for way too many years. Cenk Uygur: So why are you letting them? Now let me tell you the record. The number of fraud cases brought by Obama’s Justice Department is lower than the number brought by Bush’s Justice Department. We got the stats on that in the next segment of our broadcast. 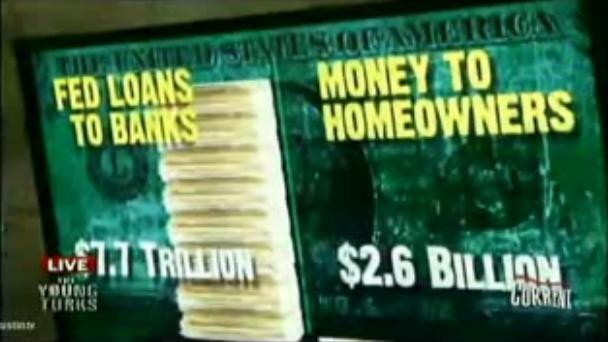 When you talk about how the banks are doing their business, Obama talks a half of a mean game about it, but then when he turns around, they can still do the derivatives trading just like they could before, the banks are even larger than they were before, and they still gamble with our money. So what did you do to fix it? But when elections come around, all of a sudden Obama sounds like a progressive. Now let me show you a chart which is absolutely stunning. The big banks got $7.7 trillion from the Fed, and, of course, they got another $700 billion from TARP. And what did they get for the homeowners, the guys that Obama says that he’s looking out for now? $2.6 billion. So where were you when the time was for walking and not just for talking? And now the last part that annoyed or enraged me the most. President Barack Obama: Inequality also distorts our democracy. It gives an outsized voice to the few, who can afford high-priced lobbyists, unlimited campaign contributions, and it runs the risk of selling out our democracy to the highest bidder. It leaves everyone else rightly suspicious that the system in Washington is rigged against them. That our elected officials are not looking out for the interests of most Americans. Cenk Uygur: But what did you do about it? I thought that was the whole point of your campaign in 2008. That’s why I was excited by it. But was there a single campaign finance reform legislation? Public financing? Nothing. Taking on corporate personhood? Nothing. Unlimited corporation donations? Every once in a while he would say, “oh, it’s not a good thing.” But what did he do about it? What legislation did he push? Nothing. That is what is so frustrating. Now you might ask, if he doesn’t act progressive, why is he talking progressive? That’s because an election is coming up. In fact, a guy who has an online show actually predicted that Obama would do exactly this a bunch of months ago. Let’s check that out. 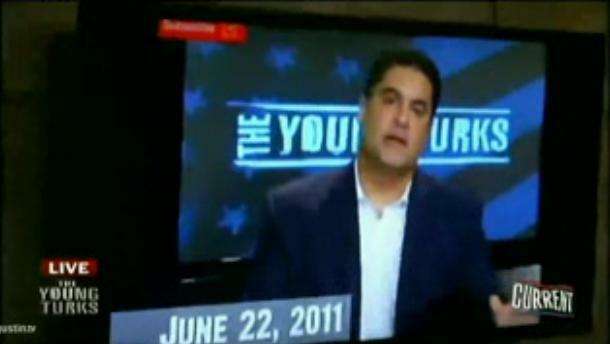 Video of Cenk Uygur on TYT: President Obama tells us if he gets a second term, oh, boy, then he’s going to be a lion. He was a lamb the whole first three years but watch out, as we get closer to the election, believe me, President Obama is going to sound a lot more progressive because the country is progressive. He knows that’s how you get votes. Cenk Uygur: And that turned out to be exactly right. Here we go. This is basically his first unofficial campaign event and all of a sudden President Obama sounds like a real progressive. Me, personally, I’m not buying it. But I want to talk to a real progressive. Most certainly the most progressive senator, Bernie Sanders from Vermont. Senator Sanders, great to have you with us. First question for you: you just heard what I said about President Obama. Do you believe him when he does these great big progressive speeches? Senator Bernie Sanders: Well, I think you ask the right question, Cenk, and that is, where has he been for the last three years? The election is coming up. He understands that the American people are sick and tired of seeing the rich get richer, the middle class collapsed, poverty growing, and he’s talking to that issue. Cenk Uygur: So my theory is, that you act progressive to get votes because in fact Washington knows—they always claim otherwise on TV—but they know that the voters are actually progressive. They can read polls, right? But when you go to get the money, well, then you’ve got to be pro-establishment. So Obama acts progressive, gets the votes, and then when he goes in office he gets Ben Bernanke, as you said, Tim Geithner, Larry Summers, Ron Emanuel, all the establishment guys. He collects money for three years, and then he turns around and wants our vote again. Bernie Sanders: This is what Washington does know. Washington does know that the American people do not want to cut social security, medicare, and Medicaid. Washington knows that the American people want the government to start taking on the big money interests and Wall Street. Washington understands that the American people are demanding that the wealthiest folks in this country start paying their fair share of taxes and that we end all of these outrageous loopholes that corporations now enjoy. That’s what the polls tell us. That’s what the vast majority of the American people want. 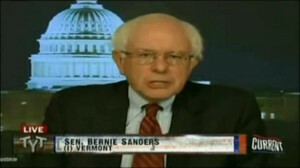 Cenk Uygur: Now that’s exactly right, Senator Sanders. So I think that the most important question is, how can the President prove himself over the next year, because the speeches are easy. We heard the speeches before, then we saw the action. So what can he do now before the election—he still has a year left—that would signal to progressives, that he is actually progressive and actually trying to get something done? Cenk Uygur: Senator Sanders, unfortunately we are out of time, but I totally agree with you. And there is a way to do it. Unfortunately right now he is still offering medicare and social security cuts as concessions, which drives me crazy. But you know what? Even past the one hundred mistakes, if between now and the election, he breaks up the big banks, I say, alright, great, that’s it, mission accomplished. That’s good enough for me. I don’t want everything. I just want some sign that you actually care and that you are actually going to take some action. Bernie Sanders: Cenk, I think what you want and the American people want to know that he has the guts to mix it up with the big money folks. 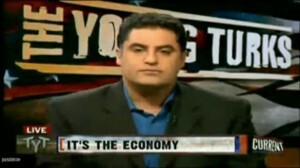 Cenk Uygur: Exactly. Senator Sanders who does have that guts, thank you so very much for joining us on the program. Cenk Uygur on Current TV, interview of Vermont Senator, Bernie Sanders, on President Barack Obama’s recent progressive speeches. This entry was posted in Accountants CPA Hartford, Articles and tagged Ben Bernanke, Bernie Sanders, Cenk Uygur Current TV December 7 2011, Cenk Uygur on President Obama's born-again progressive speeches, cuts social security medicare medicaid, heating assistance program spending cuts, how's Obama doing?, is Obama really a progressive, is President Obama a born-again progressive, it's the economy, Larry Summers, Obama does not walk the talk, President Obama speech in Kansas, Ron Emanuel, tax cuts for wealthy, Timothy Geithner, Video and transcript of Cenk Uygur interview of Bernie Sanders. Bookmark the permalink. One Response to Cenk Uygur on President Obama’s born-again Progressivism. Obama does not walk the talk.